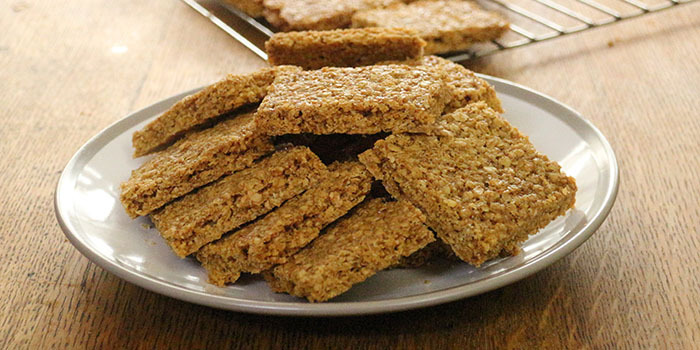 In most of the world, flapjacks are soft oat biscuits (or cookies). Except in North America and South Africa, where they look like Scotch Pancakes. This recipe is for British flapjacks. It's very easy, and the flapjacks are utterly delicious. Pre-heat your oven to 140°C (284°F) if it's a fan oven, or 160°C (320°F) for a conventional one. Melt the butter into the sugar over a low heat. Transfer to a bowl, stir in the oats and the golden syrup. Line a rimmed baking sheet with a silicon mat or greaseproof paper, and spread the mixture out flat. Use something like a potato masher or cranked spatula to create an even layer about 6mm (quarter of an inch) thick. Bake for 30-40 minutes. check them after 30 minutes - gently press the centre with your finger - it should be slightly springy and not too soft. Allow to cool for about 10 minutes, then cut into squares, rectangles or triangles and cool completely on a wire rack. The video above is from the Keef Cooks YouTube channel. Click here to see the video recipe of Flapjacks on YouTube.